I tell my descendants tall tales and true from the legendary past. The true ones inform them I was born pre-TV, pre instant coffee and dishwashing detergent, and pre-plastic. Definitely pre-plastic. There were no plastic covered polystyrene trays at the butcher's, housewives put fruit into home-made string bags, and children knew the grocer would serve broken biscuits with his bare hands: there was nary a latex glove in sight, and said bikkies were always presented in a paper bag. This was saved to do duty for at least one school lunch: Tupperware and its ilk were invented in the USA in 1946, but took a good 15 years to reach Australia. And even longer to reach Greece. Greeks were predictably instant fans of plastic, for plastic represented convenience and an end to domestic struggle. The first Christmas my family and I were in the Peloponnesian village I sent my two elder sons to their grandmother's house with presents of an earthern ware bowl and matching jug. Yiayia Aphrodite was somewhat less than thrilled. 'These things remind me of the bad old days,' she announced. 'Take them back to your mother and tell her I want something new in plastic.' It was a point of view, and also part of my long learning process. Aphrodite had always, of necessity, practised frugality. She cut old dresses into strips and wove cotton rugs out of them, she used matches twice if she possibly could, and she saved every piece of string. She never bought paper tissues (although she had a supply of paper napkins for visitors) or used anything that could not be washed and used again. I don't suppose she ever thought about recycling, and she certainly did not worry about the environment, but when plastic bags came into still-new supermarkets, she immediately made use of them. Handy containers, they hung from hooks and nails in kitchen and store-room, but she also cut them into strips and then plied her crochet hook very busily: I think every house in the extensive neighbourhood had received presents of circular blue and orange bathmats and doormats. Now I learn that women in Guatemala are weaving bags and bag linings out of used plastic. In a thousands-year-old Mayan tradition they use portable backstrap looms: one end is anchored to a tree or post and the strap around the waist enables the weaver to control tension. They are recycling, and making concerted efforts to escape grinding poverty. Local shopkeepers have also reverted to using banana or plantain leaves as wrapping for the goods they sell. I have been anti-plastic for a long time, and was a figure of fun whenever I produced my cloth bags in Kalamata shops. 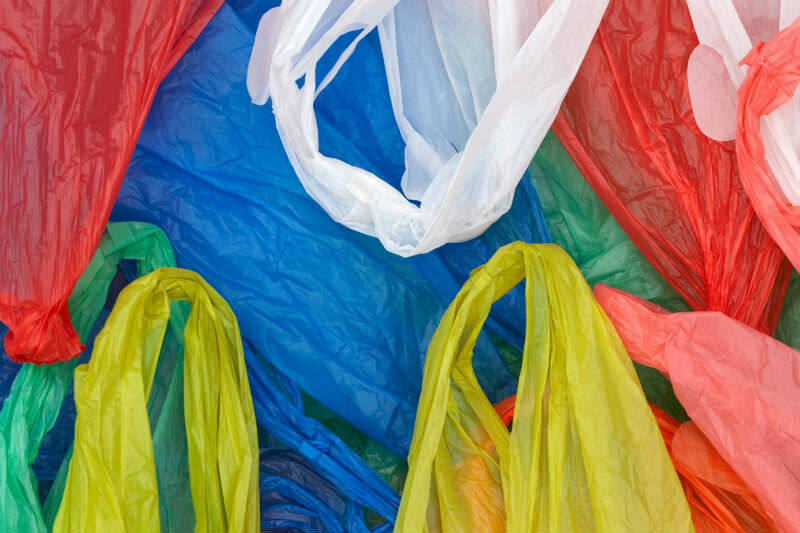 No more, for very recently Greek shops were compelled to start charging for plastic bags. Now you are asked whether you want a bag, and it has been heartening to see the number of people who bring their own. It echoes the movement in Australia over recent years to ban supermarkets from distributing single-use plastic bags. "I have been anti-plastic for a long time, and was a figure of fun whenever I produced my cloth bags in Kalamata shops. No more." It seems Sir David Attenborough's warnings about the dangers of plastics to oceans have been taken very much to heart. British milkmen, for example, are accumulating new customers at a great rate, as consumers return to glass bottles. Despite added expense, consumers are impressed by the fact that a glass bottle can be used 20 times. A milk supply company in Hampshire has registered 3500 new customers since January, a London one 2000. Now writer Margaret Atwood is organising a petition urging Starbucks to replace its plastic cups with cardboard ones; coffee bars in Greece would do well to take the same action. Greece would also do well to consider its huge consumption of water in one-use plastic bottles. The world purchases a million plastic bottles per minute, and 91 per cent of this quantity is not recycled. England has recently launched its Refill campaign: the aim is that shops, cafes, various outlets and water fountains will provide free water bottle refill facilities in every town and city by 2021. Pure water for everybody, available free, was a Victorian ideal, hence the number of water fountains still in English streets. Contemporary Australians copied this example, yet last time I checked, the water fountains on the St Kilda esplanade were not working. Still, change happens: one has only to live long enough. Yes. I am probably in that age group, not nearly as organised as the women you write about, but definitely trying to remember what we used to put things in during my childhood. Being resourceful in what to do with the used bags as we slowly manage to wean ourselves off their use. is such a challenge. I salute Greek inventiveness. Thank you Gillian for a very interesting article. One which is environmentally topical, and also one which I can certainly relate to. I grew up in a small country town in Victoria, and can relate to the butchers, and the string bags and more. My grandmother used to walk home from the shops with string bags quite laden. Interesting that some people from that generation were able to readily embrace some of the kitch culture of the 1960’s. I myself being one to embrace old memories was disgusted when my uncle painted my grandmothers old outside toilet pink inside. However re-plastics, despite them having a sound place in society these days, they are definitely over used in the ‘disposable areas’ of our lives. I am particularly against the use of disposable plastic cups, straws and the like. At out U3A ‘cups of tea days’ I note they ‘insult us’ with the supply of disposable plastic cups, rather than use china cups, that would enhance the ethos of the social occasion during the washing up. While I strongly advocate the use of high impact plastics for such things as double insulated electric drill bodies, I am dead against the use of same for afternoon tea parties. Plastic is certainly a mixed blessing, and, unfortunately, not an environmentally friendly one, being conducive to waste and contamination. I wonder what the archaeologists of the future will make of us? First in Europe in late 1972/early 1973 - Wow! Plastic bags! They don't get soggy and split like paper bags! Again in 1976 - in Amsterdam - a Dutch friend knitting/crocheting with plastic bags - into other carry-alls, etc! Last year in Morocco - no plastic bags at all in/from any business - all paper - but of a kind of weave clearly developed to avoid moist objects causing it to fray/collapse. On the high country - from years of waste - the wind chasing plastic all across the landscape - but at least a start has been made. To-night we called in at the local supermarket. My choice of bread rolls was - surprisingly waiting for me. Do you want a bag? Asked the woman on the checkout counter. Ah! No...the car is just outside. Things are changing! Thanks for the underscoring - highlighting - of your essay, Gillian. As usual Gillian a timely and relevant article. I remember clearing cupboards in yiayia ‘s house and discovering every size of Tupperware boxes. The problems of plastic waste , especially the micro plastics, must surely be tackled soon or we won’t have any clean water. At the first Avalon Airshow in Geelong years ago there were dozens of temporary drinking fountains installed. This was great but at subsequent Airshows they were missing and once my water bottle ran out I was forced to buy water at inflated prices from the vendors. What ever happened to 'the public good' ? Money always seems to come first. From your article the UK seems to be doing a little better than Australia. Thanks again Gillian. This article is so topical tonight. We have just watched the ABC program ‘War on Waste’ and despair of the irresponsible disposal of said plastic in the most unsuitable places. I do take heart that some progress is being made as governments and businesses are dragged kicking and screaming towards a more sustainable attitude. Hope is always good.